For over 20 years, Victoria’s Tender Care, a non-medical home care business in St. Petersburg, Florida, providing trusted companion care and quality homemaker services in Pinellas County, has always made safety its first priority. In fact, in our initial visit to the home to discuss exactly what services a person may need, we help determine the safety of their home environment to prevent falls. Our goal is to have our client experience the highest quality of life in their own home and in their community. By providing this information and awareness of potential safety and fall risks in the home and community, a client will be less likely to experience a fall. We help take whatever steps and actions so the home is as safe as possible to prevent falls. Why? Falls are the leading cause of injury-related visits to people’s homes by emergency services in the United States. Falls also are considered to be the main cause of accidental deaths in persons over the age of 65 – the primary age group our agency serves in providing quality, non-medical in-home care services in Pinellas County. 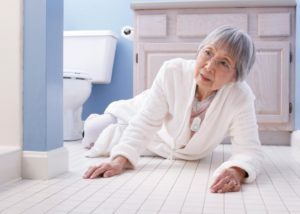 In terms of frequency of falls by older people, local statistics indicate such occurrences are fairly common. In 2013, for example, when Pasco and Pinellas County Fire Rescue teams responded to calls for someone who had been a “fall victim,” 77% (that’s nearly 14,000 reported falls) involved individuals 60 years of age or older. And that was for only falls reported; one can only imagine the true total for that year if every fall had been accounted for. So what should people look for and do in terms of accessing safety and taking measures to prevent falls in the home? • Examine the floor in each room – Then ask yourself, “Do you have to walk around furniture to maneuver through the room?” If so, then rearrange the furniture. • Remove throw rugs or use double-sided tape so rugs don’t slip. • Pick up things that are on the floor, such as magazines, shoes, toys, books, etc. • If wires or cords are in the way of walking, coil or tape them and put them next to the wall. • Survey the kitchen – Move items in cabinets used most often so they are easily accessible. • If a step stool is used in the home, use one with a bar to hold on to, and never use a chair as a step stool. • Keep the floor clear of spills and items that could cause a slip or trip. • Check Bathrooms – To enhance safety, put non-slip mats, self-stick strips or a slip resistant coating on the floor of the tub or shower, if missing. • Put in liquid soap and other dispensers at shoulder-length level and remove bars of soap and bottles from the shower and tub. • Install grab bars inside the tub and next to the toilet. • Make sure throw rugs are securely fastened to the floor, or there is a slip resistant coating on the floor to prevent slippage. • Thoroughly Inspect The Bedroom: For convenience and easier access, place lamps close to the bed. • To prevent nighttime falls when getting out of bed to go to the bathroom or kitchen, make sure there are night lights in these areas of the house. • Be sure clothing and other objects are not on the floor blocking pathways to maneuvering around the room or exiting it. • Be sure your feet are securely under you when standing after being asleep. • Use a bedside commode if getting up at night is difficult. • Here you want to pick up things on the stairs and put them away. That means don’t stack them along the edges, either. • Have someone repair broken or loose steps on the house’s exterior. Of course, that goes for the inside as well, if your have an older home with a poor staircase. • Be sure there is plenty of light on stairways. If need be, install lights at the bottom and top of the stairs, as well as glowing light switches at both the top and bottom of the stairs. • Make sure handrails are firmly attached and sturdy. Handrails should be on both sides of the stairway. For safety, use the handrails when going up or down stairs. • To improve safety, paint brightly colored strips on the top and bottom steps. This will help greatly to make them more visible. For more information on Home Safety Fall Prevention Tips, please contact Victoria’s Tender Care to receive a free brochure published by the Fall Prevention Coalition – a non-profit organization and committee under Better Living For Seniors. The Coalition’s vision is help older people age in place and to remain independent by eliminating the potential for falls. Victoria’s Tender Care has been a trusted St. Petersburg, Florida non-medical home care business in Pinellas County since 1993.